These elegantly designed Victorian styled solid wrought iron handrails are a flowing one of a kind free form metal art and architecture. 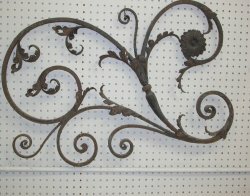 The finely designed iron leaves gently guide your eyes along flowing curls of solid wrought iron. Some leaves turn opposite of each other creating an undertow of elegant beauty with balance. Scattered gracefully along the roughly eighteen feet of each handrail you will discover uniquely designed floral medallions aiding in the seeming endless flow. 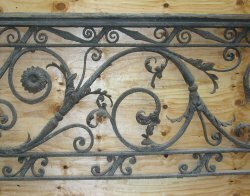 Another unique but subtle touch that seem to catch your eyes are the pinkie sized acorn's landscaped within a harp shaped solid wrought iron frame. 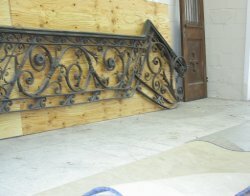 These amazing hand rails were extracted from the Sulphur Springs Hotel and Arcade located in Tampa, Florida until it was sadly razed in 1976. 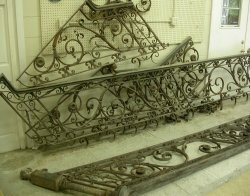 This set of antique wrought iron railings,approximately 40 +/- linear feet, has never been reinstalled and have been in storage since. 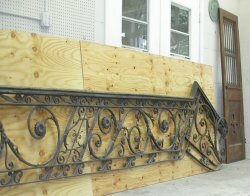 The railings are in great shape. Every piece is intact. 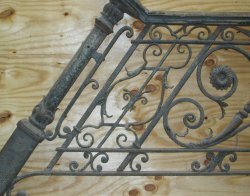 This piece of antique ironwork, when restored, will be a majestic architectural showcase for your home. 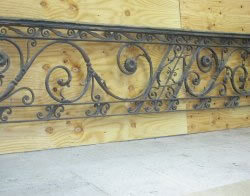 For information on purchasing the railings, please contact Don at 813.621.5167.